Offical Disney Park Picture Of The Day! 1. Your Picture Must Pertain To Disney Parks, Cruises, Or Any Disney Destination. 2. You Can Only Post One Picture A Day. 3. The Picture Must Be Taken By You. NOTE: You Can Discuss Pictures From Other Members. Just Don't Post More Then Two Times In A Row. Eh You Have To Post One LOL! I Don't Have Any On My Computer At This Time But When I Come Back From Disney I Should! I'll Post Some Then! 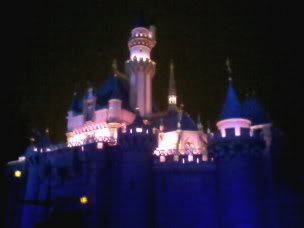 Here is a picture I took of Sleeping Beauty Castle when I was at Disneyland last February. Wow I Just Love The Castle At Night! It's So Pretty . Great Pic Savvy! Subject: Re: Offical Disney Park Picture Of The Day!